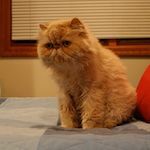 We promised my husband’s Italian cousin, Franco De’Rogati, that if anything happened to him, we would take care of his beloved Theodoro, a beautiful cream Persian kitten. Both Franco and Theodoro were born in Italy; Franco was a journalist for an Italian newspaper, and traveled back and forth between New York and Rome frequently. Theodoro was his travelling companion. Sadly, Franco’s heart gave out after bypass surgery, and we kept our promise to take Theodoro into our home and our hearts. It wasn’t hard. It delighted us to see a city cat learn the wonders of a beautiful landscape filled with birds, wildlife and, much to his surprise, other cats in the same household. Full of character, and as spry as a kitten, he came to live with us at eleven years of age. The holidays are a wonderful time for you and your pet, when you can make the best of memories together. To keep your pet safe during this time, there are several seasonal dangers that should be avoided. The FDA has issued a warning asking consumers and veterinarians to be on the lookout for illnesses caused by jerky pet treats. Over 3600 dogs and 10 cats to date have reportedly become ill from eating jerky pet treats made with chicken, duck, sweet potato, dried fruit, and combinations of these ingredients, mostly made in China. To date, the FDA has not been able to identify the cause of the illness, but the correlation between eating the treats and the number of illnesses has warranted the investigation, and they are asking for veterinarians and consumers to report any suspected cases. Join us this Fall on Sunday, September 29, 2013 from 11am-4pm for Ridgewood Veterinary Hospital's 7th Adopt-A-Pet Day. There will be 25 rescue and shelter organizations coming with over 300 pets available for adoption. Experience the joy of unconditional love. If you have room in your home and love in your heart, someone will be waiting for you! Join us this fall at our 7th Adopt-A-Pet Day! On Sunday, May 19, 2013, Ridgewood Veterinary Hospital will host its 6th Adopt A Pet Day. The hospital opens its parking lot and doors from 11:00 A.M. until 4:00 P.M. with twenty-five rescue groups and shelters hoping to find homes for more than 300 dogs, cats, and exotic animals. There will be costumed characters and vendors with free samples. Last year’s event brought over 2,700 people, who adopted approximately 250 pets. Ridgewood Veterinary Hospital's Adopt A Pet Day - Now Twice A Year! On Sunday, May 19th, from 11:00 A.M. until 4:00 P.M., the Ridgewood Veterinary Hospital will be holding its Sixth Adopt A Pet Day at 320 East Ridgewood Avenue, Ridgewood, NJ. Cats have gone from the backyard to the bedroom and in doing so their nutritional needs have drastically changed. Traditionally cats were primarily outdoors and in charge of keeping the property free of rodents. Cats are instinctually predator-prey minded and therefore spend the majority of the day seeking and capturing mice, voles, birds, rabbits and the like for the main source of nutrition. Have you ever seen a fat mouse in the wild?? - No. Cats are natural carnivores eating high protein, low fat, low carbohydrate small meals frequently and acting individually to obtain their prey. This in turn kept our cats lean and mentally active all day.